Would you like to meet people? That is what we are best at! 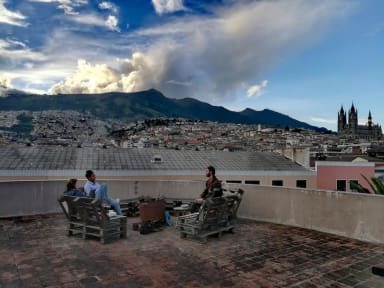 Centered around our large communal table and daily activities, from Salsa nights out on the town, movie nights, to the one and only Pub Crawl Quito, this is the place to link up with other travelers (scroll down and view our full list of weekly activities). We guarantee you'll leave with unique memories, made with new friends in an amazing city. On top of our daily activities we offer scrumptious homemade breakfasts and dinners that are unmatched here in Ecuador. Our Menu changes daily and we guarantee you will be full and happy after each and every meal with us. If the menu of the day doesn't entice you, we are more than happy to recommend other restaurants in the area. Need a goods night rest? We can do that! Come sleep in our insanely comfortable beds equipped with massive plush pillows. Each bed also includes a lockable drawer built into your frame. We provide the comforts of home that travelers often miss while abroad, as travelers ourselves, we realize that the details make all the difference! Enjoy a steamy rinse in our hot spacious rainfall showers, and dry off with our complimentary towels. Do you want the best location? This is it! Located in the heart of the Historic Center of Quito, the presidential palace, Basilica, La Ronda, Central Market and a plethora of museums are within a 5-minute walk! All of these sites can be explored on our Free Walking Tour Ecuador, supplemented with cultural and historical context by our charming, hilarious tour guides. www.freewalkingtourecuador.com As if that isn't enough within two blocks you can find a bus to every part of the city making for easy navigation to the bus terminals or airport. Most importantly we are a hostel with Heart! Your stay at Community helps fund local non profits, directly keeping us connected with our phenomenal neighborhood and region. Monday: Rooftop BBQ, grilled food up on the roof, views, fireplace, and craft beer.